Morality (from the Latin mos, custom): Folkways of central importance accepted without question and embodying the fundamental moral views of a group. Ethics (from the Greek ethos, custom): The body of moral principles or values governing or distinctive of a particular culture or group. My description of the ethical function of religion has prompted a few of my readers to request a more careful definition of what I mean by the term “ethical,” and how (or whether) it differs from another word, “moral,” that is commonly used in this regard. Before I answer this question, I’d like to put the ethical function of religion back into context where it serves as the fulfillment-in-behavior of an experience that begins in the (sometimes shocking) awareness of the grounding mystery in which All is One (i.e., the mystical function). It’s helpful to consider the system of religion’s four functions on the analogy of a tree. The mystical function corresponds to the tree’s roots reaching deep into the silent ground, while the ethical function is symbolized in the fruit, which is where the mystical nourishment from down within finds productive expression and fulfillment. As I see it, this flow from mystical experience to ethical behavior is not direct, but is rather mediated through the other two functions of religion. 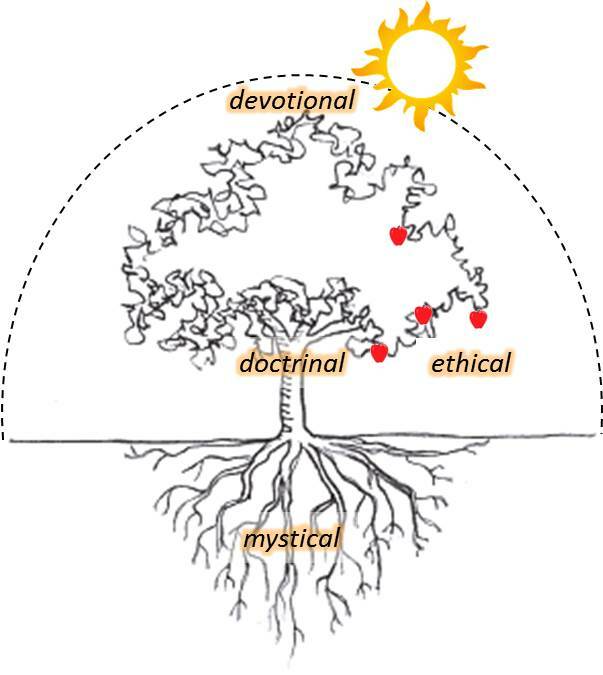 The articulate structure of the tree’s trunk and branches represents the doctrinal function, which is where the spontaneous realization of oneness is converted into meaning. (Don’t we still talk about the various “branches” of knowledge?) 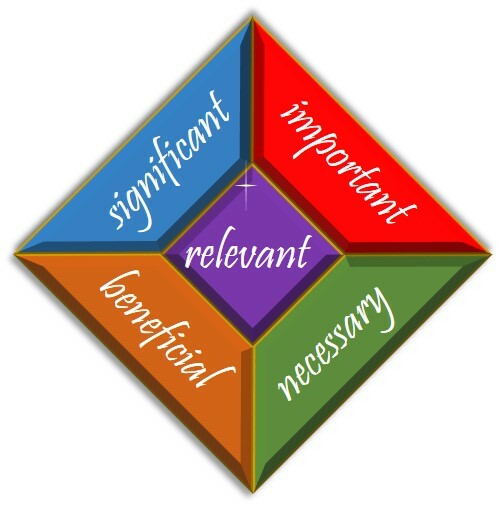 Ultimately, the behavioral product (or produce) of ethical conduct calls on the support of inquiry, judgment, reasons, and justifications – in other words, it depends on a context of meaning. We don’t just “automatically” do the right thing; ethics is about intentional behavior that involves a reasonably articulate understanding of what really (and ultimately) matters in a given situation. … and worthy of ethical pursuit. This is where in theism the devotional and ethical functions connect. And whereas in theism proper this connection operates under the radar of explicit awareness, in post-theism the literary character of the deity is appreciated as a construct of the mythic imagination which has been evolving in an ego-transcending and humanitarian direction over its long career. This distinction between behavior that is pre-reflective – “under the radar of explicit awareness” – and behavior that is guided by critical reflection is the most helpful way of distinguishing morality and ethics. As can be seen in the dictionary definitions above, both words trace back to the same basic idea (a “custom” or way of doing something), one deriving from Latin and the other from Greek. As their meanings later merged and developed in common usage, morality and ethics became differentiated to where morality now refers to the “unquestioned” rules and value-judgments that group members live by, while ethics entails a higher level of philosophical reflection on the principles that (perhaps should) govern human behavior. This difference corresponds exactly, I would argue, with the phases of “early” and “late” theism, where early theism enjoins right behavior “because god commands it and will punish you if you don’t” and late theism exhorts followers to “be merciful as your father in heaven is merciful” (Jesus in Luke 6:36). This is the shift from obedience to aspiration, which I have suggested is a leading indicator in the genuine progress of theism into post-theism (see “Stuck on God“). Our continuing challenge, as I see it, is to urge adults to grow up and not stay in that comfortable groove where because I said so – the “I” here being the parent, the police, or the patron deity – is the motive force behind our actions. True enough, actual children need this supervisory incentive for pro-social behavior, as their brains and social worldview are still in the process of opening up beyond the limited range of self-interest. What we need are adult caregivers and educators who have advanced sufficiently into their own self-actualization and expanded horizons-of-life to support and encourage youngsters into maturity with “reasonable urgency.” We can still speak to them of provident reality in personal terms, as god’s benevolent care for all creatures, even as god’s loving concern for each of us. But at some point, the adolescent needs to be invited to take up his or her creative authority and become a self-responsible benefactor of the greater good, to embrace life on the other side of god (post theos). So we progress, however slowly and by fits and starts, from morality to ethics.